Custom quilts, memory quilts, T-shirt quilts, and more. 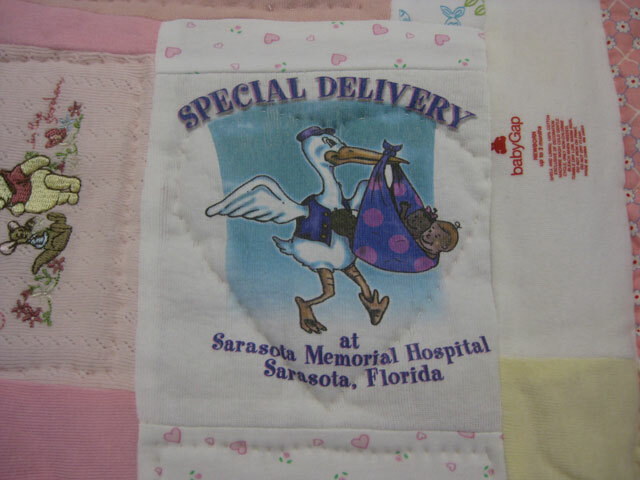 Al ma Sue's Sewists use mementos of special people and special occasions to create one-of-a-kind memory quilts. They can celebrate a personal triumph or preserve the memory of a departed loved one. 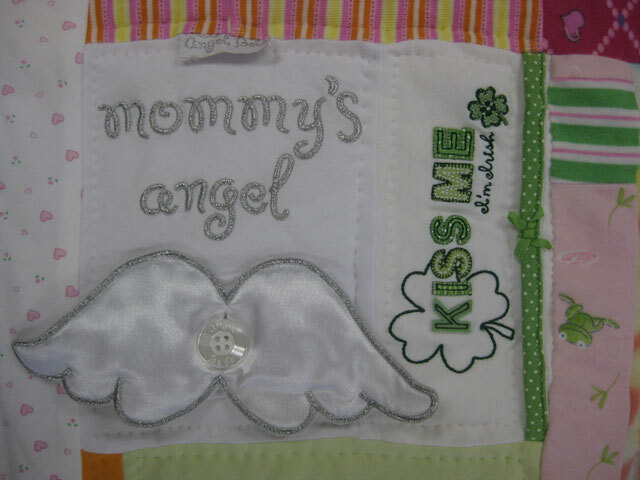 We specialize in making these quilts, which become cherished keepsakes. These photos show portions of a memory quilt that focused on the first year of a baby's life -- a year worth remembering! 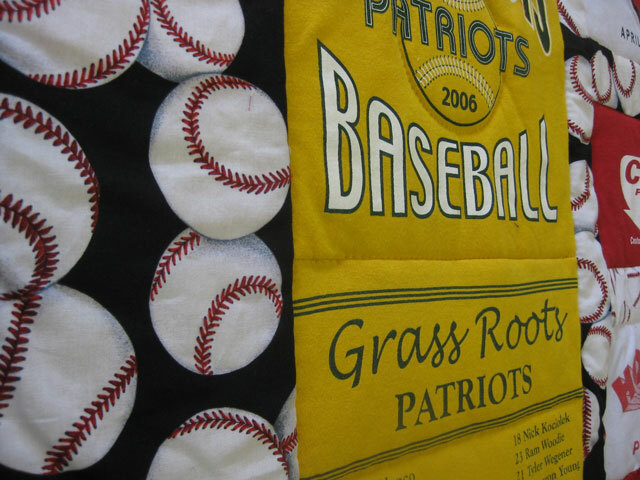 This T Shirt Quilt is a composite of T Shirts, fabric and photos from a young baseball player's Little League days. The T-shirts appear to float in a sea of baseballs. Alma Sue's Quilts specializes in Memory Quilts and T-shirt Quilts. We take great care in producing these unique pieces. You can send your T Shirts off to an unknown place found on the internet, or for the same price (or less!) you can have it made locally! Plus you can be involved in the placement and selection of fabrics and approve the design as it progresses! Call to check for availability of this service. We currently have sufficient work stretching out 2 years. Another fine, recent example was a memory quilt made from mola, which is a colorful native fabric of the Kuna people of Panama. The quilt's owner says, "They did a great job!" The owner's relative worked in the Panama Canal Zone. She brought back pieces of brilliant mola made by the Kuna people. After they went unused for many years, he decided to have a quilt made. He sketched what he wanted and brought the mola pieces to Alma Sue's. Ella designed the layout and Alma Sue's "stitching ladies" did the quilting. 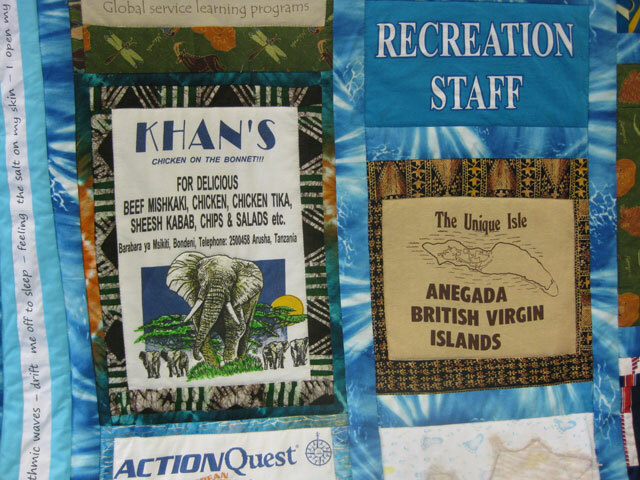 The photo above left is a t-shirt quilt made from a world traveler's collection of tee shirts. The words of a poem written by the owner while traveling are printed around the edge of the quilt in a border. Depicted below are several pillows made for several grandsons from Grandmother's memorable outfits. Another customer was one of four children who wanted to remember her late father. She brought her father's flannel shirts to Alma Sue's Quilts and we transformed them into four throws -- one for each of the three children and one for the widow. Another customer was a woman whose children missed their late grandfather. They asked, "What are you going to do with all those shirts that Grandpa had?" The answer was: Make a quilt! At Alma Sue's Quilts, we did. On the left is a tee shirt quilt made for a graduation gift. On the right is a stuffed animal made from a Grandmother's favorite outfits. This fine quilt shown here is whole cloth. It contains thousands of yards of thread. 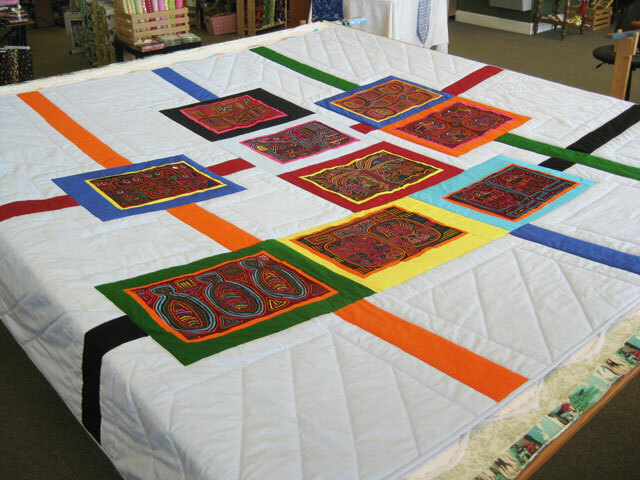 It was purchased in France and brought to Alma Sue's Quilts for finishing by a customer. Whole cloth quilts harken back to the days, some 200 years ago, when quilting was still in its infancy in America. The finest quilts came from Europe, where some of the most accomplished practicers of the craft would spend many hours quilting a single, large piece of cloth to give it a textured, "relief" appearance. 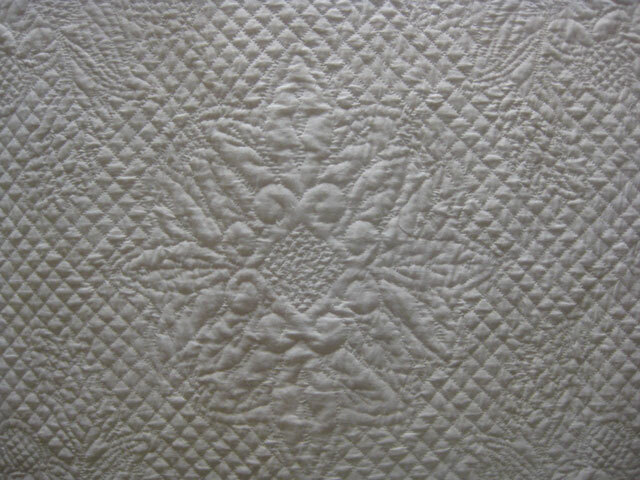 That sort of exquisite needlework is evident in the whole cloth quilt that arrived recently at Alma Sue's Quilts. It is, in fact, one of a kind -- an heirloom which, like a tapestry, will last for hundreds of years. The finished piece is entered into a quilt show in North Carolina. We are proud of our hand stitching. Call the shop at (941) 330-0993 for details of how you can take advantage of our Blue Ribbon-winning handiwork. The quilt shown here was awarded 1st place in the large applique division at a Friendship Knot Quilter's Guild show held in Sarasota. This quilt also received the "Viewer's Choice" award. Let us finish your quilt. Call or stop by our shop to ask questions. 1. DO NOT baste layers together. 2. ASK US about the batting. Our machines perform best with the USA batting we provide. No batting with scrim or adhesives! 3. ASK US about the lining size. It needs to be 4-6 inches larger than top on all sides. 4. Limited by size - one side must be 100 inches OR LESS. Rebinding, repair holes, replace fabric pieces, rebuild blocks. This is tedious work, done by hand, using vintage fabric or similar reproduction fabric. Extensive restoration may take 6-12 months, depending upon the damage. Rebinding and minimal repair can be completed in several weeks. 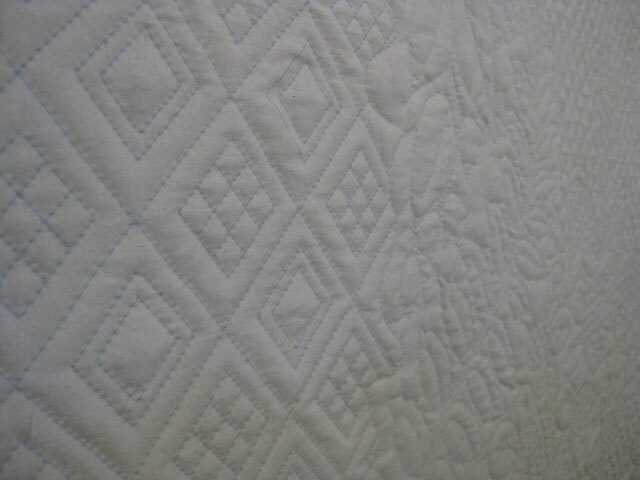 Call 941-330-0993 for an appointment to bring in your quilt for review and estimate.